This sweet book follows Clara as she journeys to her Bubbe’s home to fry latkes for Hanukkah, then to her Grammy’s to make sugar cookies for Christmas. While with each grandparent, she learns more about the holidays and the traditions that go along with them. With sweet illustrations by Sandra Salsbury, December’s Gift is such a warm story with Clara’s doting grandparents showing her how to make special family recipes ,while her cute kitten closely monitors her progress. And instead of being about how many presents Clara will collect, the “gift” she comes away with is the realization that these traditions will be ones she can pass on to her own family some day. It’s a lovely message for this time of the year. 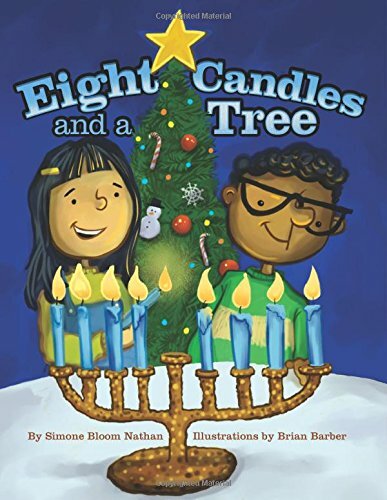 Simply written for very young kids, Nathan’s 2014 title follows a boy named Tommy who is curious about his neighbor Sophie, because she celebrates not only Christmas, like Tommy, but also Hanukkah. After being invited to Sophie’s fun-filled Hanukkah celebration, Tommy asks Sophie why she has both a menorah and a Christmas tree. I think her explanation will ring true for many families who both observe both holidays. One thing I really appreciate about this picture book are the illustrations by Brian Barber, featuring both Black and white friends and family coming together in Sophie’s home. It seems right that a book about the diversity of holidays should also include some diversity of people.